If you have built the CTS yourself, $CTS_ROOT will resemble the path out/host/linux-x86/cts but differ by platform. This reflects the path where you have uncompressed the prebuilt official CTS downloaded from this site. Inside the zip, the testResult.xml file contains the actual results. Open this file in any web browser (HTML5 compatible browser recommended) to view the test results. If testResult.xml displays a blank page when using the Chrome browser, change your browser configuration to enable the --allow-file-access-from-files command line flag. Note: The results are provided to help you ensure the software remains compatible throughout the development process and act as a common format for communicating the compatibility status of your device with other parties. 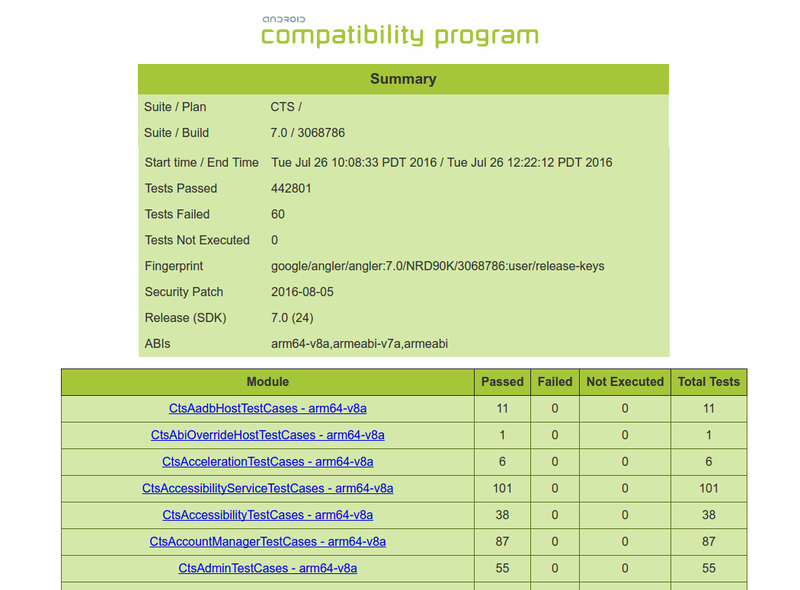 The Test Summary section provides executed test plan details, like the CTS plan name and execution start and end times. It also presents an aggregate summary of the number of tests that passed, failed, timed out, or could not be executed. 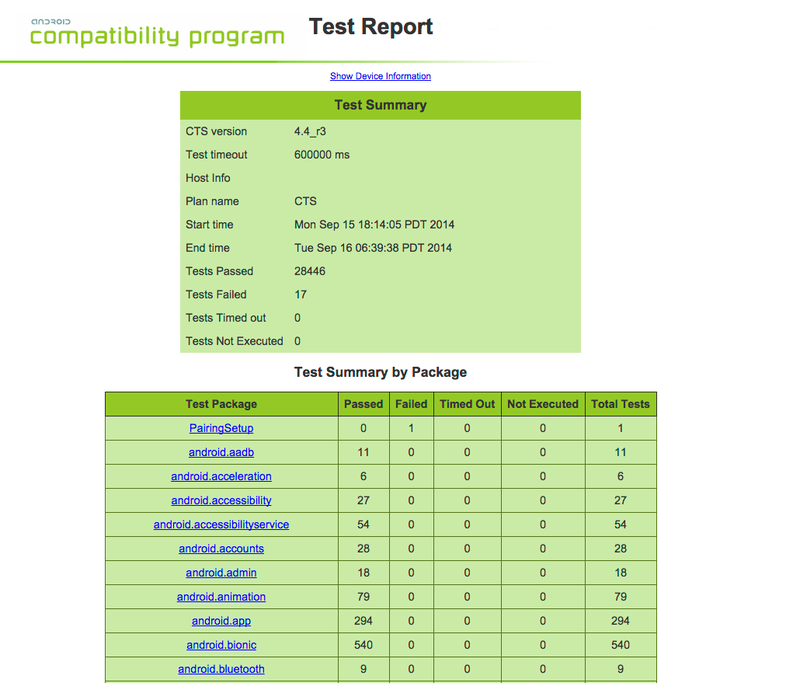 The next section, the CTS test report, provides a summary of tests passed per package. This is followed by details of the actual tests that were executed. 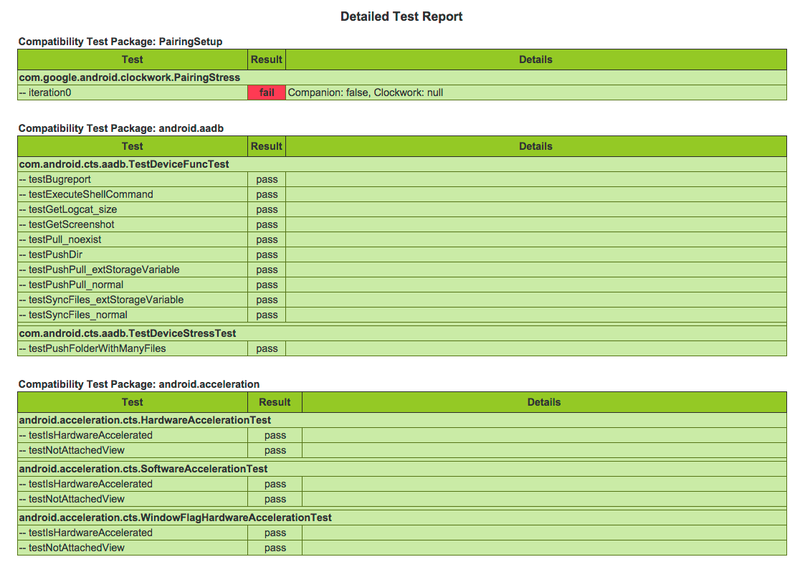 The report lists the test package, test suite, test case, and the executed tests. It shows the result of the test execution—pass, fail, timed out, or not executed. In the event of a test failure details are provided to help diagnose the cause. Further, the stack trace of the failure is available in the XML file but is not included in the report to ensure brevity—viewing the XML file with a text editor should provide details of the test failure (search for the <Test> tag corresponding to the failed test and look within it for the <StackTrace> tag). 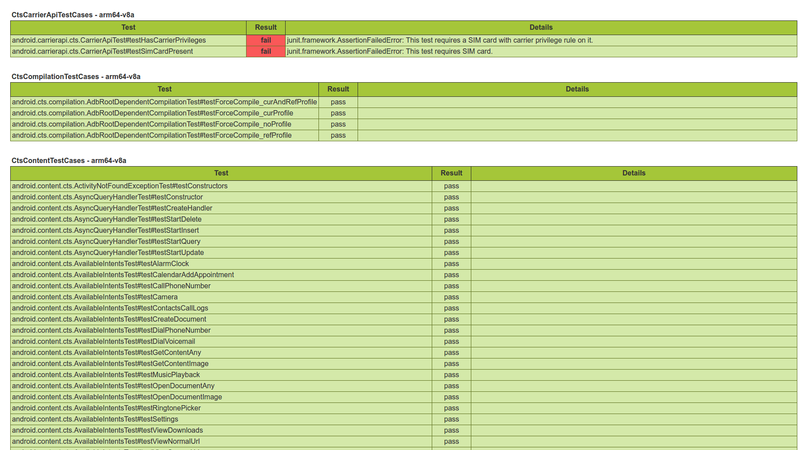 To determine the number of incomplete modules in a given test session, run command 'list results'. The count of Modules Completed and Total Modules are listed for each previous session. To determine which modules are complete vs. incomplete, open the test_result.xml file and read the value of the "done" attribute for each module in the result report. Modules with value done = "false" have not run to completion.